In order for Israeli-Palestinian peace talks to succeed, a seat at the negotiating table may be needed for the Hamas terrorist group, the Archbishop of Canterbury, Justin Welby, has warned. 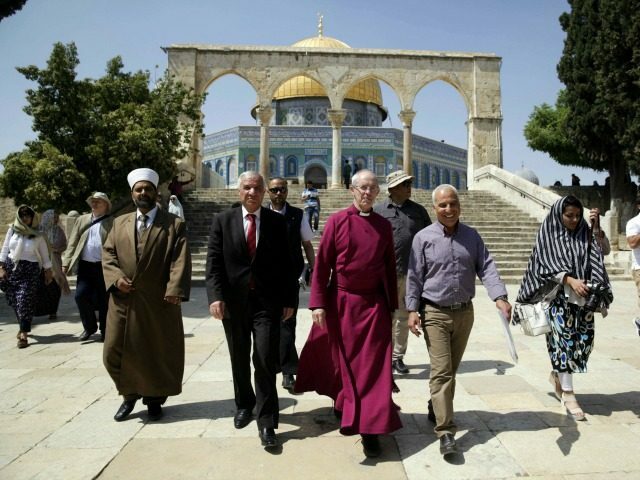 Welby, on a 10-day tour of the Holy Land, spoke to the Guardian newspaper after visiting Hamas strongholds in the Gaza Strip. The terrorist group has long called for Israel’s total destruction and rejects the Jewish state’s right to exist as it backs “armed struggle” against it. In line with British government policy, Welby and his aides did not meet Hamas officials on their brief visit to Gaza but talks should not be ruled out, Welby said. The British government, along with the EU and the U.S., adopted a policy of not talking to Hamas after the faction won Palestinian elections in 2006 and took control of Gaza the following year. Welby’s latest Mideast intervention follows his call earlier this week for bridges to be built between Christians and Jews to help fight the rising tide of global anti-Semitism, as Breitbart Jerusalem reported.